“Publishing as practice as resistance.” Different versions of the talk have been delivered at the Boston Art Book Fair (10/13/18), Boston University (11/13/18), California College of the Arts (1/24/19), Parsons School of Design (3/25/19) and Stevens Institute of Technology (3/26/19). “Publishing Needs to Get More Radical,” A conversation with Annette Gilbert in Kunstforum International, Germany. Sept, 2018. “Urgent Archives,” essay published in Public, Private, Secret: On Photography and the Configuration of the Self, Charlotte Cotton, ed., co-published by Aperture and ICP, 2018. Also appears in Library of the Printed Web: Collected Works, 2013–2017, published by Paul Soulellis, 2017. “Search, Compile, Publish.” Originally delivered as a talk at The Book Affair, Venice, Italy, May 2013. Self-published as a newsprint broadsheet, edition of 500, distributed for free at the NY Art Book Fair, September 2013. 2016 update delivered as a talk at Miss Read, Berlin, June 2016. Included in Publishing Manifestos, edited by Michalis Pichler, May 2018, and published by MIT Press, March 2019. “Muddy Waters” appears in a special broadsheet on the occasion of Nicholas O’Brien’s Treatment, the Plan for Rain at Knockdown Center, NYC, May 8–July 1, 2018. “Urgent Archives,” Design Insights talk delivered at Walker Art Center, March 27, 2018. “Sanctuary,” essay included in Safe, a pavillion curated by Christopher Clary for The Wrong Digital Art Biennial, January 2018. “Rozendaal: The Path to Abstraction,” text accompanying the presentation of into time.com as part of Net Art Anthology, Rhizome, Dec. 2017. “Performing the Feed,” a talk delivered at The Cybernetics Conference, NYC, November 2017. 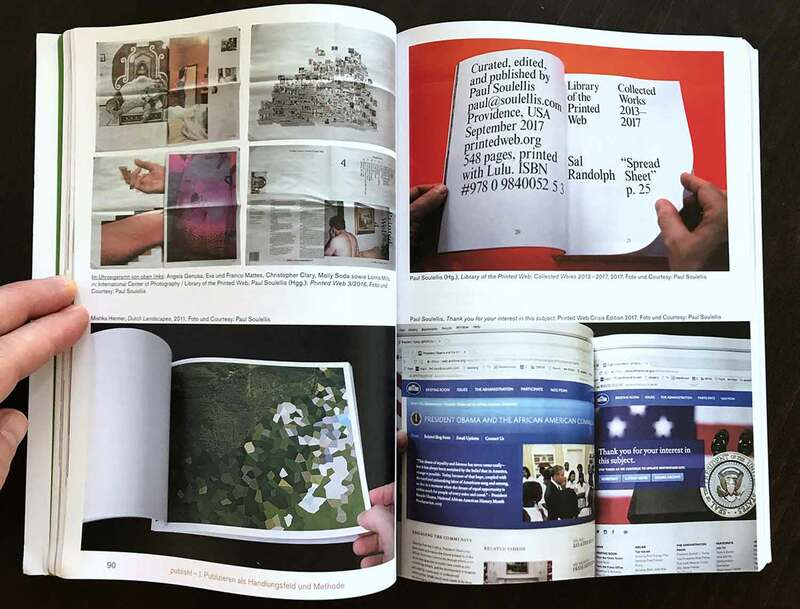 Published by Rhizome in its Seven on Seven 10th Anniversary Magazine What’s To Be Done?, May 2018. “Merging with the Network,” interview with Eva and Franco Mattes accompanying the presentation of Life Sharing as part of Net Art Anthology, Rhizome, Oct. 2017. 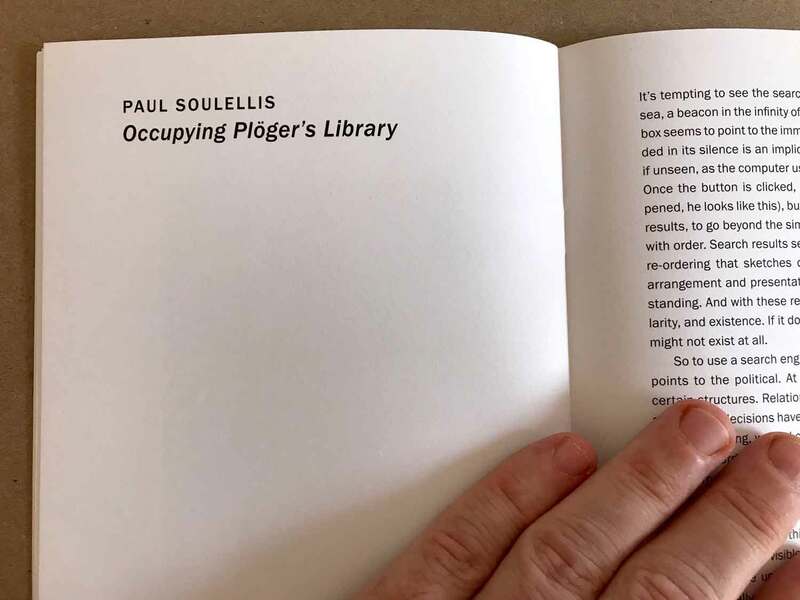 “Occupying Plöger’s Library,” essay published in exhibition catalogue for Inherited Lies by Wolfgang Plöger, Konrad Fischer Galerie, Düsseldorf, 2017. “An improvisation,” an 8-page work for White Zinfadel magazine, with the John Cage Trust, May 2017. “Notes on Feeds” (PDF, text only), talk delivered at Interrupt 4, Brown University, April 28, 2017. “The Download 6: A Desktop Lamentation,” Rhizome, Sept. 2017. 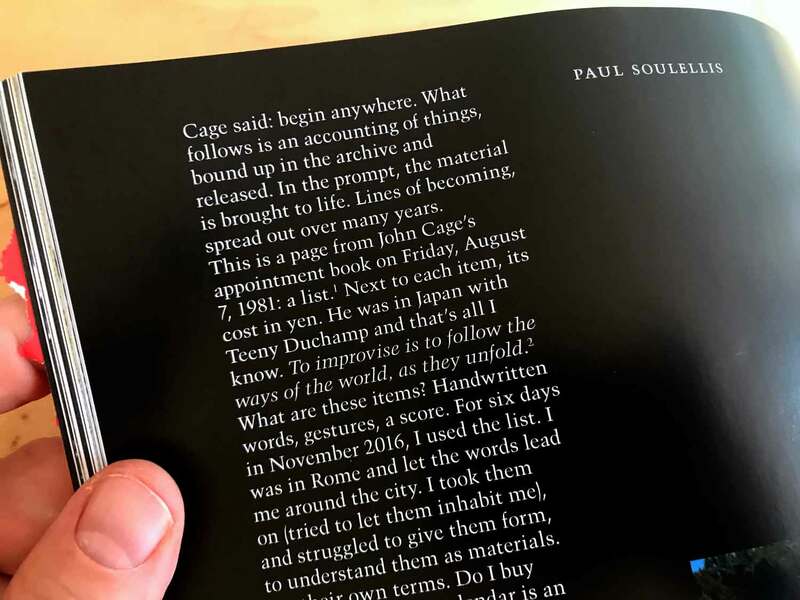 “Library of the Printed Web: The Guy Who Makes Art Out of the Internet,” Vice Magazine, The Future of Tech Issue, Feb. 2017. “Carrying, embeddedness, printedness. Window-into-the-page. A grand assembling.” Talk performed at Printed Matter on Dec. 2, 2016 for the launch of Morehshin Allahyari and Daniel Rourke’s 3D Additivist Cookbook. 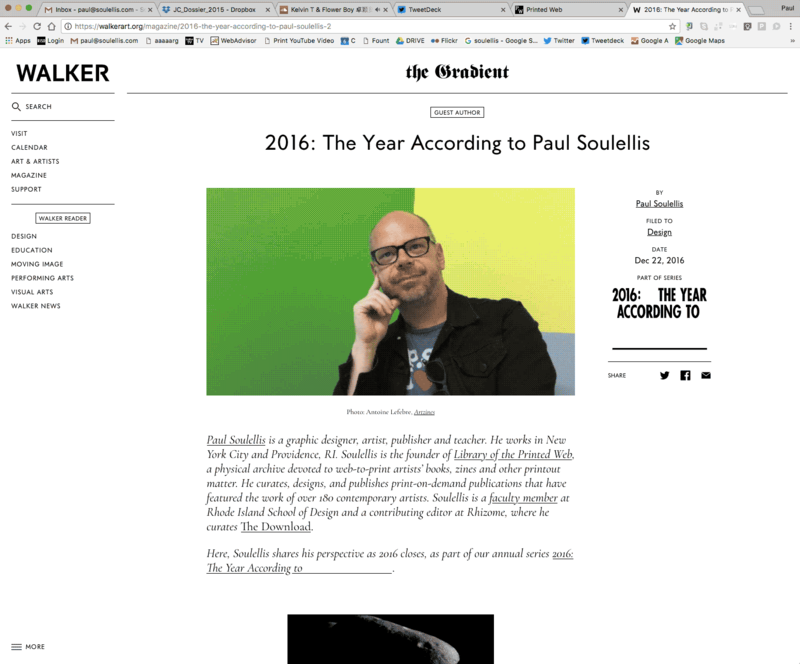 “2016: The Year According to Paul Soulellis,” Walker Art Center, Dec. 2016. “The Download 5: Dennis Cooper’s GIF Novels,” Rhizome, Nov. 2016. 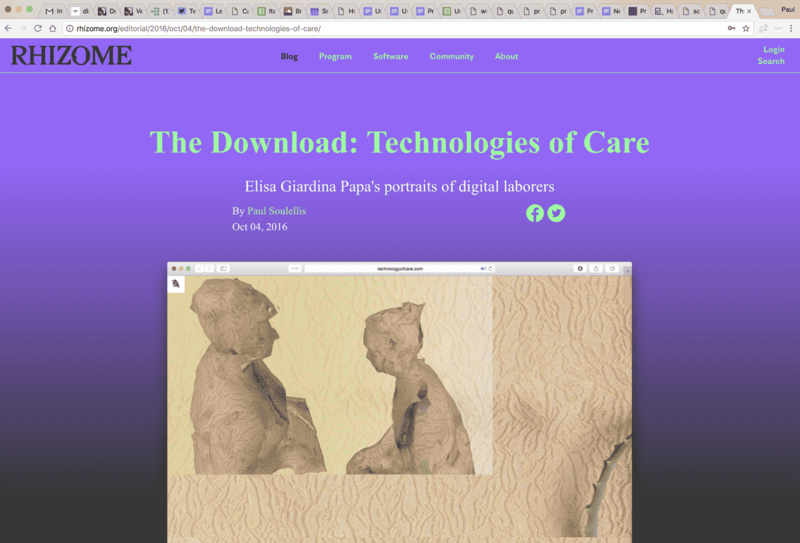 “The Download 4: Technologies of Care,” Rhizome, Oct. 2016. “Artist Profile: Lorna Mills,” Rhizome, September 2016. “Artist Profile: Travess Smalley,” Rhizome, July 2016. 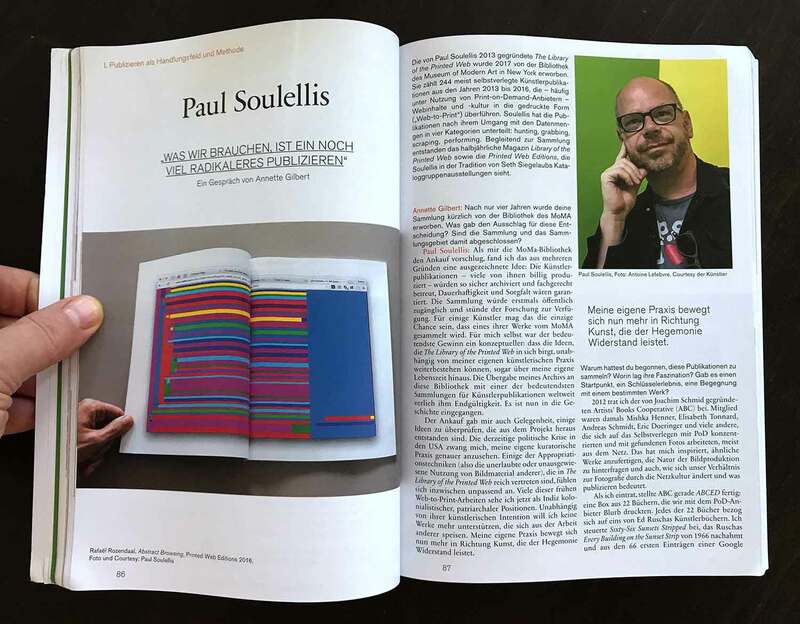 “A conversation with Paul Soulellis,” interview with Kate Palmer Albers, July 2016. “The Download 3: Incantations for the Birth of a Network,” Rhizome, May 2016. “The Download 2: The Distributed Monument,” Rhizome, Feb. 2016. “After the Hookup, An App,” Rhizome, Dec. 2015. “A BOOK IS THE BOOK: A READING IN 142 PARTS,” talk performed at Printed Matter for the launch of Code X (Danny Aldred and Emmanuelle Waekerle, eds. ), Nov. 2015. “The Printed Web,” essay in Span: Conversations About Design and Technology, (Rob Giampietro, Amber Bravo, eds. ), Google Inc., Nov. 2015. “The Download: Sorry to dump on you like this.zip,” Rhizome, Nov. 2015. 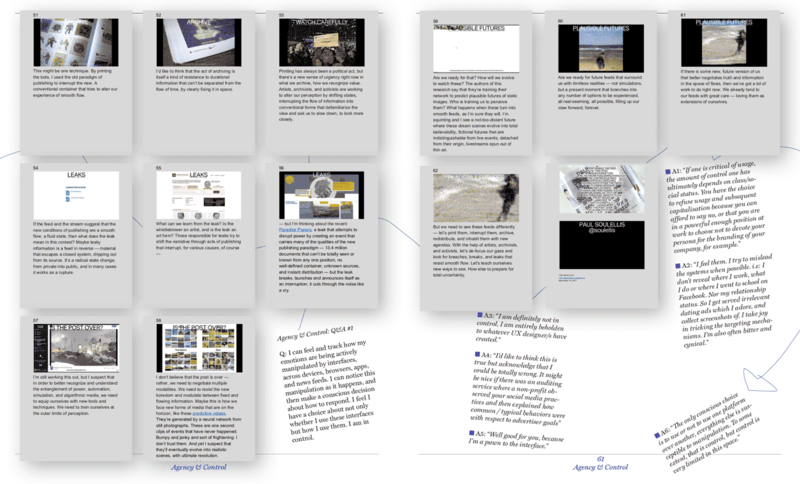 “Poor Media on Demand: All the files of Printed Web 3,” Rhizome, May 2015. 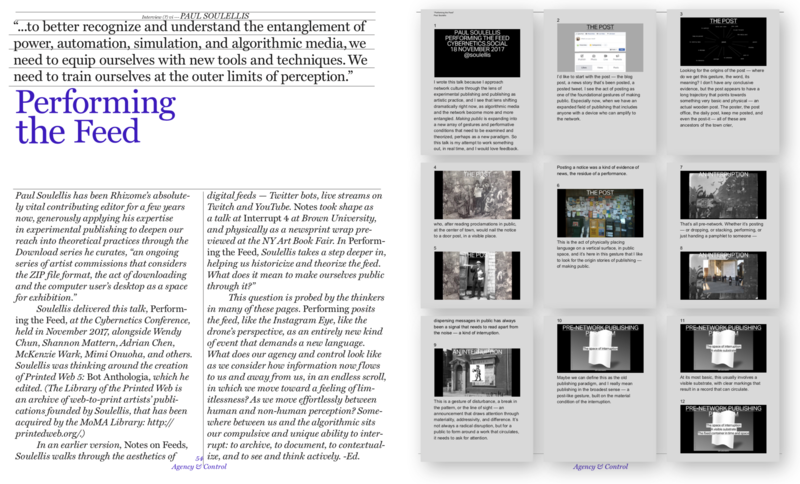 “Digital Publishing, Unzipped,” Rhizome, March 2015.